Buloke Woodlands Conservation - Kowree Farm Tree Group Inc. The Linking Community and Landscapes: Buloke Woodlands of the Wimmera project assisted landholders to protect and improve their remnant patches of Buloke woodland. Found mostly on the fertile flats of the Wimmera, buloke grassy woodlands are home to a wide range of threatened flora and fauna including; the bush stone-curlew, diamond fi retail, fat-tailed dunnart, olive legless-lizard, broughton pea and buloke mistletoe. Mature bulokes also provided essential food for the endangered south-eastern red-tailed black cockatoo. Research has shown that buloke trees take about 100 years to produce seed for the cockatoos, demonstrating that the protection of existing buloke trees is essential for the bird’s survival. Trust for Nature, through funding from the Federal Government’s Caring for our Country, is ran a three year project to protect and restore the remaining patches of buloke woodland and other important vegetation types in the Wimmera. The project recognised the value of mature buloke trees and has incentives available to landholders to assist in their protection. 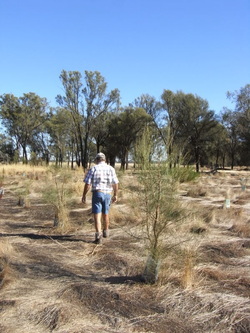 Trust for Nature worked with Grampians to Little Desert Biolink and the Kowree Tree Farm Group to help landholders protect their patches of bush. The project provided money available to assist landholders to protect, manage and restore their remnants of bush through fencing, covenanting and short-term agreements, planting and pest plant and animal control. This project was a continuation of 5 years of Buloke Conservation work on private land that was carried out by the Kowree Farm Tree Group.